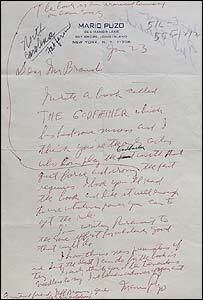 Marlon Brando's annotated script from his 1972 film The Godfather has been sold for $312,800 (£175,418) at a New York auction. 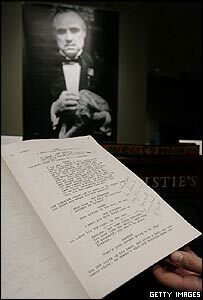 The script fetched more than 20 times its estimated price, and is the highest amount paid for a film script, auction house Christie's said. A letter from author Mario Puzo asking Brando to take the role of Don Corleone sold for $132,000 (£74,011). The auction of Brando memorabilia made more than $2.3m (£1.3m) in total. It featured items removed from Brando's Los Angeles home, where the actor lived from 1960 until his death in July 2004. The previous record for a film script was $244,500 for Clark Gable's copy of Gone With The Wind in 1996. Puzo's letter to Brando read: "Dear Mr Brando, I wrote a book called The Godfather which has had some success and I think you're the only actor who can play the part. "I know this was presumptuous of me but the best I can do by the book is try. I really think you'd be tremendous." A photograph of Brando and Rita Moreno in the 1968 film The Night of the Following Day, which was the only piece of memorabilia the actor kept in his home, sold for $48,000 (£26,918). A telegram, dated 1961, from Brando to screen star Marilyn Monroe sold for $36,000 (£20,192). One of the actor's children, Miko Brando, said in a statement: "I feel humbled by collectors and fans who have spent so freely to own a piece of my father's heritage and history." Prices included a 20% buyer's premium on sales up to $200,000 (£112,230) and a 12% premium on amounts exceeding that.